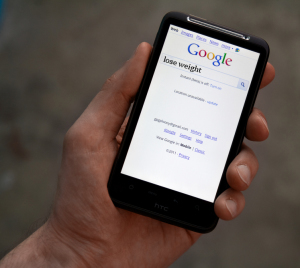 Mobile device usage is up in nearly every category, and I wanted to understand if I should do anything with my AdWords account to specifically target mobile device users for my hypnosis and hypnotherapy services and classes. Using Google Analytics it's pretty easy to understand what percentage of your overall traffic is from a mobile device, and also where those mobile customers are coming from. Once you have that information, you can make better decisions on what to do with your advertising dollar, and whether to target specific ads to a mobile audience. Open up your Google Analytics account. Select "Audience" --> "Mobile" --> "Overview" in the left margin. This information, displayed to the right is a breakdown of device usage on one of my sites. You can see in this case, almost 70% of the users are on a desktop, but almost 20% are on mobile devices! That's a significant amount, and it's likely to increase over time. Ensure "Primary Dimension" is set to "Device Category"
Select the "Secondary dimension" drop-down button, then expand the "Acquisition" section and choose : "Source / medium"
That view will show you where your desktop and mobile customers are coming from, enabling you to make better choices for modifying your AdWords account. In my case, I can see that 10.5 % of my customers are mobile customers coming in from Google CPC (AdWords). That's almost 11% of my customers, and so it's likely a good idea to take a look at customizing my AdWords account for mobile users. Next time I'll go into more detail on how to target mobile users using your AdWords account, and why or why not you may want to do that.